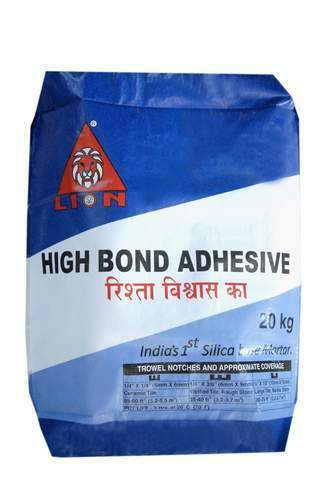 Lion High BOOND Adhesive for use to fix on heavy stone, heavy marble, window framing , floor , wall, ceiling etc. We “Lion Industries” is a well known firm and engaged in manufacturing and supplying a wide range of Concrete Hardener, SBR Latex Waterproofing, White Cement Based Putty, Ultra Bond Waterproofing, Tile Adhesive, Block Jointing Powder, PP Fiber Waterproofing Powder, Liquid Waterproofing Compound, L Poxy Epoxy Grout, Ready Mix Plaster and Glass Mosaic Tile Adhesive. We are a Sole Proprietorship Enterprise that is actively dedicated towards providing the best class products as per the global set standards. Under the headship of our mentor “Mr. Ritesh Patel”, we have gained a dynamic position in this industry. When we started our business in the year 2004, we have developed a large infrastructural unit that is situated at Ahmedabad (Gujarat, India). We offering our products under the brand name Lion.